The Orlando Magic scored another definitive victory over the Charlotte Bobcats, 92-77, in Game 2 of their first round playoff series on Wednesday night. Stephen Jackson led the Bobcats with 27 and keyed a fourth quarter rally that briefly made things interesting late, but the Magic ultimately led wire to wire, putting all five starters in double figures. This one had an even uglier start than Game 1. 8 minutes into the first quarter, the two teams had only combined for 16 points; problem was, the Cats only had three of those. Fortunately, the Cats got a few buckets to make the count a not-quite-as-embarrassing 18-14 after the first quarter. But frankly, the damage had been done. Orlando’s zone-ish defense rendered the Cats offense (not exactly potent to begin with) into a bogged-down, turnover-filled mess. The Cats finished the game with 21 turnovers, and no one outside of Stephen Jackson ever figured out how to score. The fact that the Bobcats play some pretty good defense themselves kept the game reasonable; the Cats were only down 11 at the half, and cut the lead to 8 with 3:15 left in the game before succumbing. The Magic simply had too many weapons tonight. Though Dwight Howard was held to a modest line (15 points on 5-10 FG/5-12 FT, 9 rebounds, 2 blocks) he was absolutely dominant for a stretch early in the third quarter that set the tone for the rest of the second half. Rashard Lewis and Jameer Nelson were solid and reliable, if unspectacular, while Mickael Pietrus and Ryan Anderson provided an onslaught of threes off the bench, combining for 5-7 from distance. There were almost no silver linings for the Bobcats in this one. The late run that cut the deficit to 8 was intriguing for a minute, but rationally you knew it was too little, too late. Nazr did show some signs of life (5-6 FG for 10 points in 16 minutes). But basically, I’m grasping at straws here. The only one that may be worth a damn is simply that the Cats have played much better at home this year and Games 3 and 4 are in Charlotte. The Cats had the biggest home/road record differential amongst all the playoff teams this year, for no reason that anyone could logically explain. At this point, I’d give up trying to explain it if I could just see it for Games 3 and 4. Apologies for recycling my Twitter posts, but is anyone else getting the same feeling they used to get watching Jeff McInnis a couple of years ago when watching Larry Hughes these days? Raymond Felton and Boris Diaw have been frustratingly ineffective, as have Hughes and Tyrus Thomas off the bench. The Cats have a couple of days to stew on this one. Game 3 is on Saturday afternoon at 2PM ET at the Cable Box. The Charlotte Bobcats fell 98-89 to the Orlando Magic in their playoff debut Sunday night. We’ll have a more in-depth recap up later, but I wanted to post some quick thoughts and have a place for you guys to make some comments as well. Here’s the AP recap and box score. That first half couldn’t have gone worse. The Bobcats were attacking the paint, but in a half-hearted manner that allowed Howard to rack up 8 blocks. Meanwhile, Jameer Nelson was frying Raymond Felton (see above picture) and the Magic were draining three after three (9-18 3PT in 1st half). However, the Cats showed some resolve in battling back in the second half. Gerald Wallace beasted it (25 and 17), Stephen Jackson gutted it out on a hyperextended knee, and the Cats were able to cut the lead to as low as 4 late in the game. The Cats got nothing beyond Gerald, Jack and Felton. Diaw or someone from the bench is going to have to step up in order for us to take a game or two. Chandler did have a nice stretch in the third quarter to key a Bobcats run, but it wasn’t nearly enough. Game 2 on Wednesday. Thank goodness for the 2 day break in between Games 1 and 2 — Jack’s knee is sure to swell and tighten up, but hopefully he’ll be ready to go again by Wednesday. Let’s hope it’s not too bad. Make sure you’re following us on Twitter in the meantime. UPDATE: At halftime of the Spurs/Mavs game, the TNT guys indicated that Jack will have an MRI on the knee (no brainer) and showed a quick post-game interview of Jack in which Jack dismissed any concerns, saying he’d be ready to go if Game 2 were tomorrow. The final entry in our Round One Playoff Preview. DrE: The coaching matchup is one where the Bobcats may be able to get a distinct leg up on the Magic. Nothing against Stan Van Gundy — I mean, he got the Magic to the Finals last year — but you always feel like he’s just a couple exasperated tirades away from having his team tune him out. Probably wouldn’t happen for another season or so, but I could imagine the seeds for it being planted in the playoffs this year. One of the great things the Magic have that keeps the tightly wound Van Gundy from grating too much on his team is the happy-go-lucky, slightly immature personality of their star, Dwight Howard. Coach and star are perfect foils for each other, keeping things balanced. ASChin: SVG has proven himself as a top tier coach both with Heat and now with Magic. His “Master of Panic” style may get him into some trouble with Big Ego alphas like Shaq but more reserved guys like Howard don’t seem to have a problem with him (yet). As our friend Bonnell mentioned yesterday in his blog, Van Gundy utilizes a pro version of the old “4 Out, 1 In” offense. As you’ll see from this excellent link at Coaches Clipboard, the 4-1 has traditionally been used for teams that have a lack of big men. The strategy is to space the floor with shooters, pulling away defenders from the paint, and attack the basket through series of perimeter screens and picks. The “1 In” has to pull double duty as the team’s only post player and offensive rebounder. The strategy is unique in the NBA because teams running the 4-1 would generally get killed on the boards and in the paint on defense (from playing shooters at the “4” + having little interior help defense) and would have virtually no shot of securing an offensive rebound with just one man down low. The Magic pull it off by having Dwight Howard as that man. Obviously, defending the high pick and rolls and quick dives to the basket are key in defending the Magic. Fortunately the Bobcats are one of the League’s best at it. But they’ll have to be quick. Theo Ratliff and Tyson Chandler have the quickness to defend Howard on those plays but I’m not so sure about Mohammed and Diop. I could see Coach Brown substituting either Mohammed or Diop the moment Marcin Gortat checks into the game. Actually Diop would be a decent candidate to take on Howard because of his size and Playoff experience (going back to Dallas a few years ago) but we just haven’t seen enough of him over the last couple of months to know where he’s at physically. DrE: Larry Brown is several things: premier basketball teacher, great strategist, insecure leader, old guy who took a job in another city to redeem his reputation and is missing his family. I fully expect Larry Brown to coach his heart out in this series. It’s really the perfect situation for him. Coaching from the underdog position, on the big stage of the playoffs, he has a chance to finally completely repair the damage that his time with the Knicks did to his reputation. ASChin: Agreed. It’s not often in the NBA that coaching has a chance to trump talent but with LB in there, I feel confident that the ‘Cats will be in it regardless of the Magic’s superior talent. Take a look at this breakdown from NBA Playbook. It’s an excellent frame by frame look at how D.J. Augustin nailed the clutch 3-pointer in New Orleans last week. It shows the discipline that Brown has been able to instill in the team on offense. Don’t get me wrong, Charlotte still has a long way to go. They commit WAY TOO MANY TURNOVERS and are prone to settle for jumpers midway through games but when the stakes are high, the team has an uncanny ability to come through as we’ve seen from their big wins against the League’s elite (Lakers, Cavs, Magic, Jazz, Suns) this season. DrE: It’s pretty easy to argue that the intangibles are in Charlotte’s favor as well. There’s a lot of pressure on Orlando — they made it to the Finals last year, then had to make the tough decision to let Turkoglu go in free agency and bring in Vince Carter. If they don’t at least get to the Conference Finals, this season will be a colossal disappointment. And now they have to do it with Vince Carter — degree of difficulty is way higher! Meanwhile, the Bobcats have great chemistry right now. Say what you want about Stephen Jackson, but his teammates love him everywhere he’s been and Charlotte’s no exception. Just look back to the infamous Jack-led 8-seeded Warriors first round upset of the Mavericks in the 2007 playoffs to see how his toughness can spread, especially against a team that shows signs of being soft. ASChin: Hmmm. Although the Bobcats aren’t an 8th seed like JAX’s Warriors a few years back, there are some similarities popping up again with Orlando. The Magic are coming off a semi-unexpected Finals appearance in which they had a legitimate shot to win (see Dallas circa ’07), the Magic have basically been penciled in to make at least the Conference Finals again (as Dallas had just come off an outstanding regular season in ’07) and the Magic, like the Mavericks, seem to be a little too focused on Cleveland in Round 3 instead of worrying about the here & now of Round 1. DrE: So you ready to make a prediction? In the end, the Magic are just going to be too much, but I think the Bobcats will certainly make them sweat on their way out of the first round. I say Magic in six. ASChin: If the Magic take the series, I can’t see them winning in less than six games. They ‘Cats just have too much fight in them. I’m gonna go full-on Delano Little here and predict an upset. Bobcats in six. They’ll need to steal one of the first two in Orlando to do it but it’s possible. 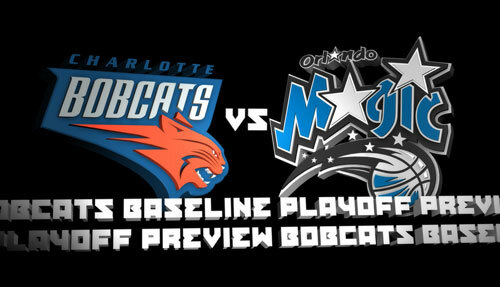 Welcome to Bobcats Baseline’s preview of the Bobcats first ever playoff series. First, some general stuff. The Magic finished the year 59-23 (34-7 home). They posted the best overall point differential in the league this year: +7.5. Hollinger’s formulas have them ranked as the second best in the league in terms of offensive efficiency (behind only the Suns) and tied with the Bobcats for first in defensive efficiency. Head to head, Orlando won the season series over the Bobcats 3-1. The Magic took the first game in Orlando back on November 10, 93-81. Game two just six days later in Charlotte turned out to be Stephen Jackson’s Bobcats debut, but the game went to the Magic again, 97-91. The Cats took Orlando to overtime in Charlotte on January 23, but the Magic once again prevailed, 105-95. Finally, in the last matchup on March 14, the Cats broke through for a 96-89 win, despite playing in Orlando without an injured Gerald Wallace. Now lets get down to the matchups. ASChin and I decided to do a collabo for this, and we’ll start by breaking down the battle in the paint. Dr. E: In the middle, Dwight Howard creates problems for every other team in the league. He led the league in rebounding and blocked shots for the year. It’s almost universally agreed upon that Orlando could be even more dominant if they made a more concerted effort to get him the ball on the offensive end (which they don’t always do, especially in the fourth quarter). But it’s almost as if Larry Brown knew this matchup was coming. He’s collected a cadre of serviceable big men to play center-by-committee. Theo Ratliff is like an older, wiser version of Tyson Chandler, who has shown signs of life himself in recent weeks. Nazr Mohammed has looked rusty in two games since returning from back problems, but was a revelation earlier in the season with his ability to score in the post. And Gana Diop is, well, Gana Diop (or Joey Crawford’s avatar). Together, they represent four bodies and 24 fouls that could be deployed to wear Howard down. ASChin: Agreed. They’ll try to win the war of attrition, throwing 24 fouls at Dwight and making the other 4 Magic players beat them one on one. The last thing that you want to do is play into the Magic’s hands. They want you to defend DHO for 40+ minutes, using up fouls at the center spot. Fortunately, the Bobcats have enough bodies in the middle to combat this somewhat but as you see in the breakdown vid below Dwight can now make you pay for single coverage. Dr. E: The other way the Bobcats may try to neutralize Howard will be to get him into foul trouble himself. In this blog post from Rick Bonnell (once you get past the nonsense about how Rick and Gerald Wallace are like peas in a pod) Wallace stresses that the Cats need to take it straight at Howard to have a chance. Howard averaged 3.5 fouls per game this year, fouling out four times and getting to five fouls more times than I bothered to count. Of course, if Howard gets into foul trouble, backup Marcin Gortat is more than capable of becoming an X-factor. ASChin: This is a big deal. The Bobcats aren’t a great jump shooting team. They’ll have to continue to go to the hoop to have any chance in this series. With Dwight down there, it’ll be tough but I’m guessing that Coach Brown will try to run a lot high screen pick and rolls with Chandler and Ratliff to try and get Howard out out of the paint. Lets move on to the 4 spot. Rashard Lewis is having far from his best season as a pro. His FG%, ppg, rebounds and blocks are way down. Not exactly want you want from an $18 million a year guy. He still shoots lights out from beyond the arc so the ‘Cats will again have to prevent the Magic from forcing a double team on Howard down low. I think a platoon of Tyrus Thomas and Boris Diaw matches up well against Lewis. Diaw in particular is going to force Lewis to guard him on those little post jump-hooks and when Howard comes over for the block, Boris is crafty enough to be able to find Chandler or Mohammed for a dunk or layup with a quick pass in the paint. Also, look for Crash to play some minutes at the four if Brown decides to turn the tables and go small. Dr. E: By the way, was it ever fully explained what Lewis’s 10-game PED suspension to start the year was all about? Ironic that he’s clearly fallen off this season, isn’t it? Some may write it up to missing training camp and never getting in the groove, or missing Hedo Turkoglu’s point forward drive-and-dishes, but has anyone measured his head circumference-to-testicle ratio serially over the years? Anyways, yes, between Stephen Jackson, Gerald Wallace, Tyrus Thomas and Boris Diaw, the Cats are better suited than most teams to guard and switch out onto Rashard Lewis at the three point line. Alright, that covers the bigs. Next up, we’ll discuss the wings and guards. After that coaching and intangibles. ASChin: Wait, did you just mention Rashard Lewis’s testicles? The Bobcats defeated the Magic in Orlando 96-89 on Sunday night to earn their sixth straight win. The Cats improved to 34-31 overall and maintained their hold on the 6th spot in the East. Though Dwight Howard finished with 27 points on 12-14 FGs, the Bobcats were able to keep him frustrated and in foul trouble all game. With Gerald Wallace sidelined by an ankle sprain, the Bobcats looked to Stephen Jackson to pick up the slack. Jack delivered with 28 points (10-20 FG, 3-5 3PT, 5-6 FT), 6 rebounds and 6 assists. Most importantly, as the game hung in the balance in the fourth quarter, when the Cats of old wouldn’t have been able to score, Jack had three huge buckets and two free throws to seal the win. Defensively, the Bobcats played another solid game. Dwight Howard, Vince Carter and Michael Pietrus combined for 70 points on 26-40 FG, but the rest of the Magic only managed 19 points on 7-32 FG. 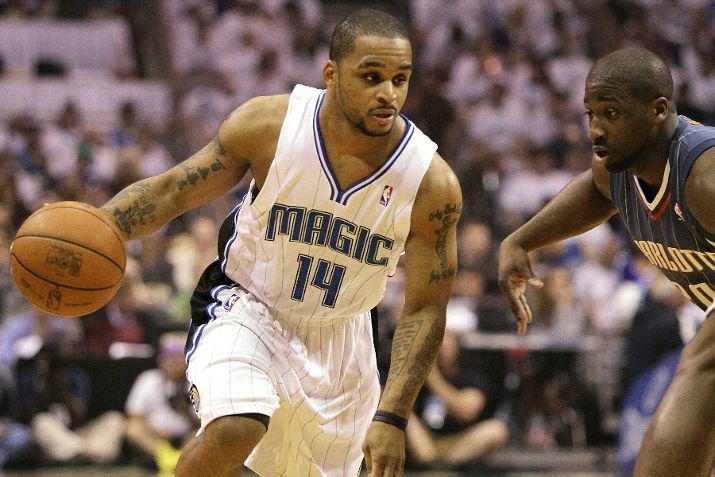 Jameer Nelson and Rashard Lewis, in particular, shot a combined 3-17 and 1-9 3PT. Theo Ratliff put in a days work, playing 32 minutes guarding Dwight Howard. Theo finished one rebound short of a double-double with 1o points and 9 rebounds. Stephen Graham filled in admirably for Gerald Wallace, with 12 points (4-8 FG, 1-2 3PT, 3-3 FT) and 6 rebounds in 30 minutes. Speaking of Crash, he is traveling with the team despite the fact that he didn’t play and has already been ruled out of Tuesday’s contest with the Pacers. When interviewed during the game, Gerald said that he’s been wearing a protective boot over the weekend, but was hoping to take it off tonight. He also indicated that he’d try to play as soon as allowed, knowing that he’ll be playing through soreness. And speaking of the Pacers, apologies for getting this post up late — I got hooked into the ESPN 30 for 30 documentary that premiered tonight on the Reggie Miller/Pacers vs. Knicks rivalry. Fantastic stuff. Orlando marches into the Cable Box and puts an emphatic end to the ‘Cats nine game home winning streak with a 106-95 overtime victory. AP recap here. Box score here. With their two stars struggling (more on that later), the Bobcats still managed to take the Eastern Conference Champs to OT due to the efforts of D.J. Augustin and Gana Diop. D.J. brought out his ’08-’09 game tonight going 8-14 from the field with five threes finishing with 22 points – most of them CLUTCH as the Bobcats were making their 4th quarter run. D.J.’s best game of the year without a doubt. DIOP-IT-LIKE-IT’S-HOT defended Dwight Howard (10 points) so well in his 22 minutes of work, that Mark Cuban’s decision to offer Gana the full mid-level a couple of years ago now looks quasi-sane. Diop’s stats don’t look like much (6pts, 4rbs, 2blks) but his presence was felt on defense and his ability to run the floor in transition kept the Magic honest. The Bobcats found themselves down by as much as sixteen points in the third quarter due to a barrage of three pointers by Rashard Lewis, Jameer Nelson, Vince Carter and JJ Redick. It wasn’t that the ‘Cats were playing bad defense, the Magic were just hitting a lot of ridiculous shots. Lewis’ 6’10” frame and long wingspan makes his high-release three unguardable; Nelson was having a St. Joe’s flashback with a gimpy Raymond Felton playing tight; Carter dominated early and disappeared late (surprise); while JJ checked in, got the “Christian Laetner Memorial Greeting” from the fans – then coldly nailed a three. Eight of Twenty-Nine. That’s what Stephen Jackson and Gerald Wallace shot combined. Add in Boris Diaw’s 2-9 and Raymond’s 6-15 and you have the starters KILLING the team’s chances for victory by anchoring a 40% shooting performance. Not to take anything away from the Magic (especially in OT when they took it to another level trapping D.J. and Ray on the perimeter and taking away the pick and roll) but JAX and CRASH just couldn’t get anything going. If Jackson normally “makes love to pressure” then this was a game in need of CIALIS. JAX launched ugly shot after shot and spent most of the game jack-jawing with the officials. Same goes for Wallace – who didn’t help his All-Star campaign by registering a DUD while being held in check by defensive maestro Vince Carter (seriously, this actually happened). The team’s focus seemed to be on the upcoming road trip for most of the game and this was exploited during the OT lay-down that saw Orlando scoring the first eleven points of the extra frame. 19,000+ at the TWC tonight! NICE JOB BOBCATS FANS! Maybe DR E’s recent crowd pimping really worked. If I had any remaining insecurities about my uber-receding hairline, they are now fully eliminated after seeing HD close-ups of Vince Carter. Thanks Vince. Raymond didn’t have a great game but his gutsy performance coming off of the ankle sprain was appreciated. If the team can ink him to a deal of around $6.5 – $7 million per, he’ll be a high value player in the League. As well as Nazr has been playing recently, he still doesn’t punch in those easy 2-footers as consistently or emphatically as Tyson Chandler. Chandler missed his 14th consecutive game and let’s hope that the team can get something out of him (either on the court or via trade) before the season is over. The Bobcats fall on the road to the Orlando Magic tonight, 97-91, to drop to 3-7. AP recap here, box score here, Bonnell story here. The Cats actually led this one 52-50 at the half off some hot shooting from Boris Diaw and Flip Murray. However, a dismal 16-point quarter put them down 8 heading into the final period, and the Cats just don’t have the firepower to mount a 4th quarter comeback of that magnitude against a team the caliber of the Magicians. Flip Murray’s 31 points tied a career high for him, and represent the best scoring night of any Bobcat thus far this season. Raymond Felton spent most of the night in foul trouble, and DJ was again ineffective, so Flip played 34 minutes (many while running the point) and filled it up on 13-21 FG, 2-6 3PT. However, Murray missed a chance keep the Bobcats alive and set a new career high when he missed a couple of free throws in the fourth quarter. Stephen Jackson had a decent debut for the Bobcats; he started, played 45 minutes, and generally acquitted himself pretty well with 13 points and 9 rebounds. However, his shot was not falling (4-14 FG, 1-4 3PT, 4-8 FT) — had a few more of those dropped, we might be talking about a pretty special debut. One of the real benefits that Jackson provided, and will hopefully continue to provide, doesn’t even show up in his numbers, though. It’s in the numbers of Raymond Felton (6) and Gerald Wallace (5). What are those numbers, you ask? Field goal attempts. With Jackson around, there will be less pressure on Felton and Wallace, two inefficient shooters, to provide scoring. Tyson Chandler continues to be disappointing for the Bobcats; got in foul trouble early and only played 24 mins, with 2 points, 4 rebounds. Nazr continued to play well off the bench; but the Bobcats were most fortunate that Gortat was out for the Magic, who thus went small when Dwight Howard was on the bench and allowed the Cats to go small as well. No one had a huge night for the Magic — but they put 7 guys in double figures in an impressive team performance. No minutes for Gerald Henderson, Derrick Brown or Alexis Ajinca tonight; understandable, as LB saw a chance to steal a win and stuck with the veterans. DJ has no confidence out there. 2 points on 1-4 FG in 13 minutes. His poor start to the year is probably the most under-discussed concerning thing about the Bobcats right now. At this point (of the night, but also of this Bobcats season) I’m out of dramatic adjectives, but here’s the link for interest: Bonnell reports that Iverson’s camp has “reached out” to Larry Brown in the wake of AI and the Grizzlies agreeing to an annulment. You know what? At this point, why not? Maybe it would be the Bobcats “dancing bears and midget car” moment (thanks, “Bobcat orange?”), but I rather agree with my Baseline compadre, ASChin — while the Bobcats are mortgaging their financial future and risking any remaining bit of community goodwill that was based on having “good guys” on the team in order to get to the playoffs, we might as well go down in a blaze of glory. Next game is Wednesday night in Philly to take on the almost-equally disappointing 76ers at 7PM ET. Won’t be live tweeting due to the early start, but will catch up with the DVR and have a post up here late Wednesday night.